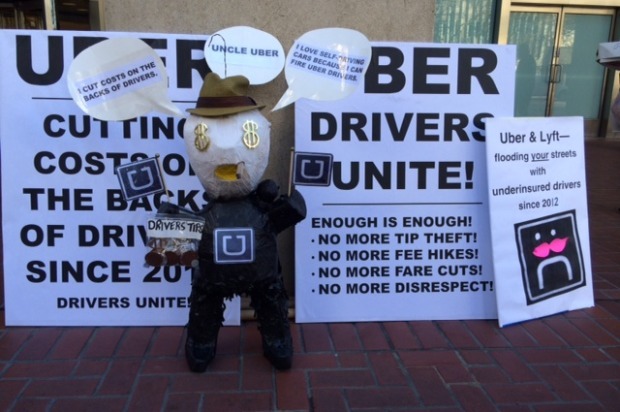 Dozens of Uber drivers held a rally in front of the company’s headquarters in San Francisco this afternoon to protest what they say are unfair wages resulting from Uber policies that set impossibly low fares in an effort to out-price their competitors. Drivers in other major cities such as Santa Monica and London, who disagree with Uber’s driver policies as well, joined today’s protesters. Many of the drivers who showed up today were greeted by passing Uber drivers who slowed down and honked as they passed the Uber headquarters at 1455 Market St. The rally comes just two days after San Francisco International Airport announced a pilot permit allowing Lyft and UberX drivers with transportation network companies to legally pick up and drop off riders at the airport, according to SFO spokesman Doug Yakel. The transportation network company Sidecar previously signed a permit with SFO last week, according to Yakel. But many UberX drivers and taxi drivers alike say the company is taking advantage of drivers and jeopardizing public safety. UberX driver and longtime San Francisco resident Jean Remy said he began driving for Uber just over a year ago. He had quit his other jobs because he was making a nice salary driving for the company. Remy said in the good old days he was making about $300 a day for a seven hour shift, before taxes and expenses, such as gas, maintenance and insurance. Now, for that same seven-hour shift, Remy said he’d make about $175, which comes to about $25 per hour before taxes and expenses. Remy said the decline in his salary came after Uber decided to cut the price of fares to outbid competitors such as Lyft and Sidecar. He said he has returned to his former job of delivering pizzas and only works for UberX during really popular hours, when surge pricing is in effect. Drivers with Uber are not considered employees, instead they are considered independent contractors, which allows them to make their own hours, but Remy said it also means they receive little to no respect from the company. “We don’t have a voice,” Remy said. The recent fare cuts have also meant that some drivers are staying behind the wheel twice as long to make the same income, according to Remy and other drivers at the protest, which raises safety concerns for drivers and passengers alike. Remy said he feels a lot of drivers were attracted to the high salary associated with driving for Uber, but that the company is now pulling the carpet out from underneath them to get ahead of competitors. He said he feels lied to. A member of the board of the California App-based Drivers Association, Ayda V., who also works as an Uber driver, came up from Los Angeles to join San Francisco protesters. California App-based Drivers Association is a newly formed non-profit membership association that promotes fairness, justice and transparency in the app-based drivers industry throughout California, according to their website. Although she didn’t want to share her last name, Ayda said that the association works closely with Teamsters Local 986 and is looking to add new members. She urged drivers to remember that they are creating billions of dollars for the company and said that they deserve some guarantees. Ayda said many drivers were financing new cars at the suggestion of Uber and now that they are bringing in half their original salaries, they may not be able to pay their car bills. Remy said he too hopes that the drivers in San Francisco can organize and unionize. He said he wants to see regulations on transportation network companies that allow drivers to be tipped, stop allowing the company to cut fares and hike their commissions on a whim. Taxi driver Ashwani Aeri also wants to see the transportation network companies further regulated and not just cause they’re hurting his business. “The airport was the only place we were making money,” Aeri said following the announcement by SFO that Lyft and UberX drivers along with Sidecar would be allowed to shuttle riders to and from San Francisco International Airport. Aeri, a Yellow Cab driver since 1988, said the SF airport commission is “allowing this unregulated taxi service to run like taxis, but the taxis are subject to regulations” that the transportation network companies are not. 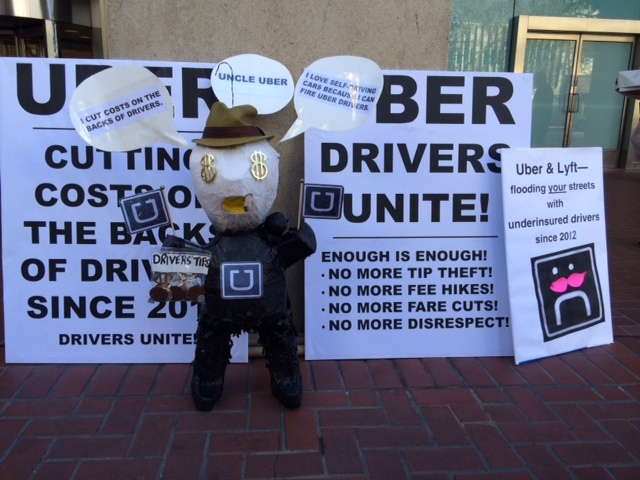 Aeri, also a member the San Francisco Taxi Workers Alliance, a union of taxi drivers, said the permits signed with Uber, Lyft and Sidecar to travel in and out of the airport were the result of closed-door agreements. Those regulations are very important, Aeri said, saying the public safety is at stake. He said drivers with UberX don’t have any security. At least he has job security, he says, even if he is only making minimum wage. He said he pays a lot to stay on the road with Yellow Cab. He pays roughly $3,500 per year toward Worker’s Compensation, about $9,000 per year toward $1 million liability insurance and about $2,000 per year toward collision insurance. He said he also has to replace his vehicle every three years and that it has to be a hybrid that adheres to the company’s color scheme. He said the transportation network companies, on the other hand, don’t require much from their drivers but in return aren’t treating their drivers with respect and are now cutting their salaries. Both taxi drivers and network transportation company drivers are expected to come out on Nov. 4 at the California Public Utilities Commission’s public hearing for a review of the rules that govern transportation network companies.